I’ve been looking forward to this moment all year. And it’s finally here- summer camp in Velipoja! 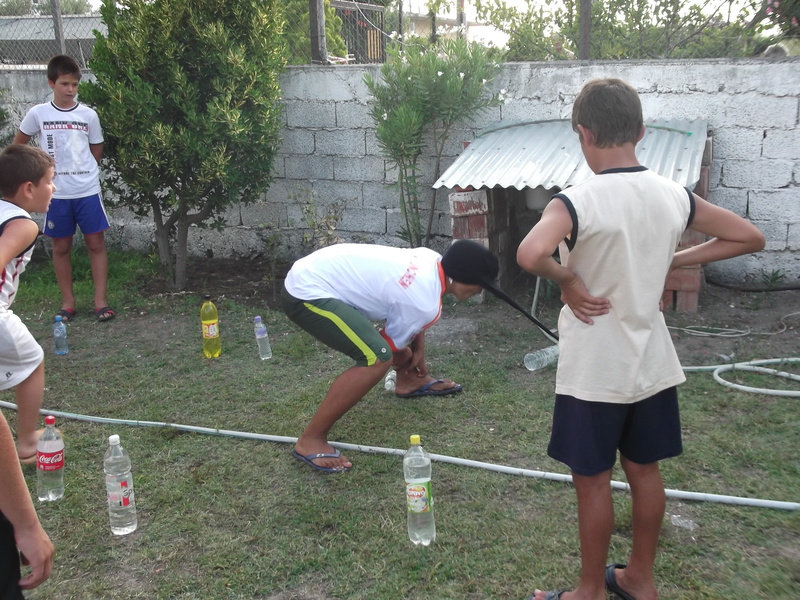 For the last 10 days I’ve been living in Velipoja (a small town beach near my home in Shkoder) with 28 Shqiptar boys. That’s right, 28 of them. Last year, my counterpart and I started Shkoder’s first-ever girls English Summer Camp. We invited 15 girls to spend 15 days at my counterpart’s cabins on the beach where we would do all kinds of traditional American summer camp activities. This year, to make it bigger and better (forever in the name of progress and forward movement), we decided to extend the camp to include boys. And we ended up having to turn people away. Talk about improvement! So what does summer camp in Albania look like? For starters, it’s a lot of chaos. It’s nearly impossible to walk into a situation here with a 100% American idea and try to make it happen right off the bat. These kids have never had a camp experience in their lives. They have zero expectations and zero ideas about what they will be doing at camp. So we literally had to build it from the ground up. Layers upon layers of foundation building to teach not only my counterpart how to run and plan a camp, but also to teach the campers how to get the most out of their 10 days away from home. Exhausting. Utterly exhausting (but worth every minute!). But honestly, these kids would be happy if we did nothing buy lay in the sun and talk and play soccer all day. In Albania there is a serious lack of youth activities. There is no where for them to go and nothing for them to do. In the summer, in the winter, it doesn’t matter. All year round the only real Shqiptar thing you can do is get coffee at a little cafe along the street and people watch and gossip about your friends that walk by. I see boredom and hopelessness and apathy in the faces of some many of my students that it truly breaks my heart. Until they arrive at summer camp, that is. They tell me all year that they can’t wait for camp because it’s the only time they can hang out with their friends and have things to do all day long. They live for this moment. And that makes my job worth every penny (that don’t get because I’m a volunteer). We do tons of team-building activities, ice breakers, and group games that teach them it’s okay to be silly and laugh at yourself (a completely foreign concept in a country so focused on etiquette and appearance and social status). 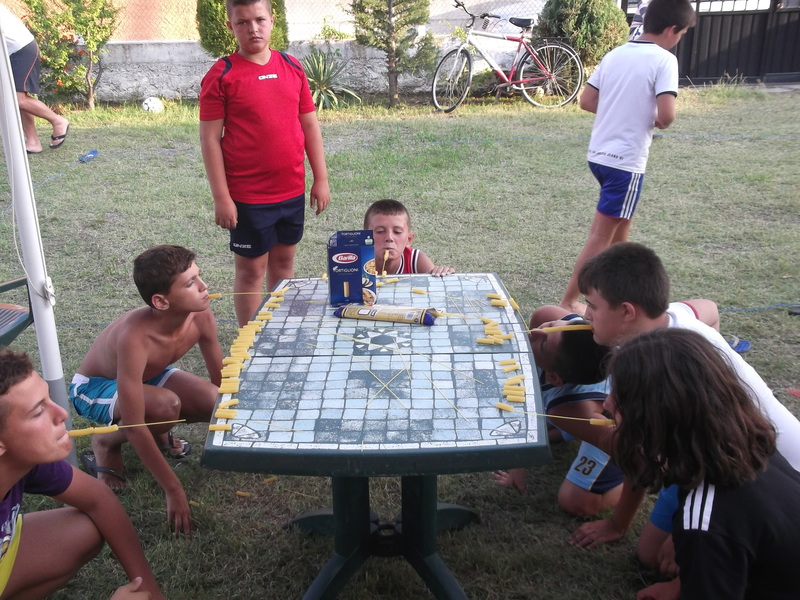 This is another “Minute to Win It” challenge…definitely a camp highlight! We do scavenger hunts that make them talk to strangers and pick up trash and work in a team to uncode clues in English. We play word games like cherades, Pictionary, Scattegories, Bingo, and more. And of course we leave time for swimming and sun bathing and roasting marshmallows and staying up late gossiping in the yard under the stars. But sometimes I get ahead of myself and have to remember that 9 times out of 10 these kids have no idea what I’m talking about. I get so excited to teach them a new game that I always have to stop, back track, and re-think it in terms that Albanians would understand. Let’s take a simple game like Marco Polo for example. We thought we explained it perfectly, but the moment we got in the water to play, all the boys crowded around “Marco and started tagging him. They thought the point was to be “it” not to run away and avoid being “it.” Back to square one. And other simple things from camp like serving yourself at dinner or cleaning up your cabin. My counterpart and the other American volunteers end up being the wait-staff and janitorial crew sometimes because they kids have a very different idea about what “camp” means. They are used to being waited on hand and foot by their parents and expect nothing less when they are away from home (especially since they are boys…don’t even get me started because during the girls camp they are expected to do everything themselves). And we can’t ask them to clean up or serve themselves because then their parents will be angry that they paid for camp and had to clean. So I refill water classes and bread baskets and pick up shoes with smile. But there are always little successes like when I turned it into a competition to have the cleanest cabin halfway through camp and all of the sudden beds where being made and floors where being mopped every morning. To which I just smiled and shook my head and laughed to myself, but didn’t say a word. There’s always a way. Tomorrow the girls arrive and we get to do it all over again. And I can’t wait. What fantastic memories you are creating for the youth. Teaching boys how to take care of themselves…change-agent!